You Can’t Stop the Wheels From Turning…. Children and wheels: It seems so easy, but I missed the boat on that one. First you buy the kid a tricycle, then a bicycle, and if you’re a little crazy and/or don’t mind ER visits, a unicycle. (I used to see a kid commuting to Edward R. Murrow H.S. on one. Amazing.) You might throw in a scooter, skateboard and roller blades. (I can’t watch anyone zip through traffic on roller blades. Death by pothole is not a good way to go.) Finally you reach the point, usually at 16, where the kid wants to stray farther and farther from home, and go faster and faster, in preparation for leaving home for good. That’s the real goal here even if we don’t want to admit it. And that’s when driver’s ed becomes a part of your life. Not my life. My daughter Emily, who’s 18 and leaving for college next month, doesn’t drive. I thought she was in a very small minority, but it turns out she’s on the cutting edge of a trend where young people are relying increasingly on mass transit or, in non-urban areas, Greyhound or Amtrak, to get anywhere. They’re just fine with that, too. Yahoo News ran a story from Reuters on Sunday and reported that more than a quarter of people in the 16 – 34 age group — the article gave this demographic the annoying nickname Millennials — lacked a driver’s license in 2010, up 5 percentage points from 2000. http://news.yahoo.com/americas-generation-y-not-driven-drive-145632280–sector.html) The story also indicated that many young adults are turning to virtual media as a replacement for the open road. That’s just weird. Until I read the Yahoo article, I was feeling a bit guilty about Emily’s lack of driving ambition. (The pun is intentional, but I’ll save that for another post.) I come from sedentary, slow-moving stock. In a wolf pack, I’d be the one invariably left with the innards. According to family myth, I didn’t walk until I was two and my mother, frustrated at having to shlep me around, dangled an Entenmann’s donut about a foot in front of me. It worked. I probably should have done something to fend off genetic inertia in my kids, like encouraging them to take tennis lessons. But that involved more movement than I’m accustomed to. I’m also overly cautious by nature. The less you move, the less chance there is to break an arm or leg. People ski into trees. They drown in riptides. The world is full of peril. Better to stay safe. I didn’t deny my kids’ need for speed entirely. They had one of those Big Wheel things — a three-wheeled vehicle that rides at ground level so there’s nowhere to fall. 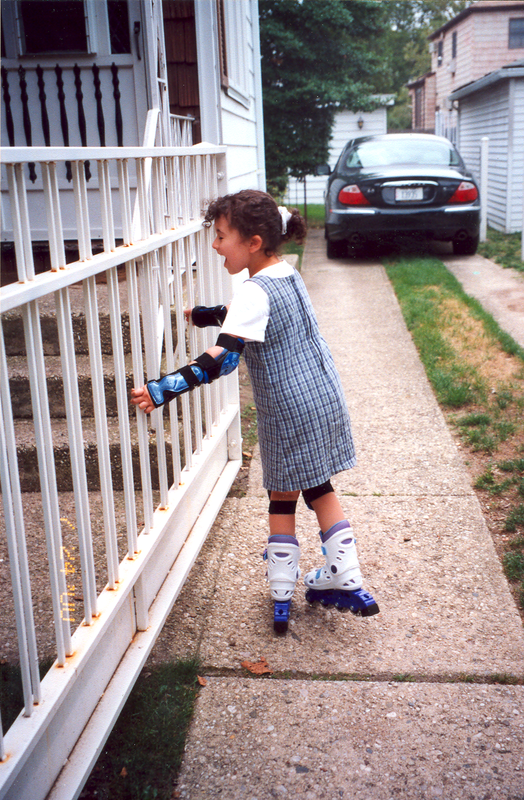 When Emily was six, she asked for roller blades. I got them for her, along with the requisite knee and elbow pads, and we went into the driveway to practice. For the next hour, she clung to the gate and screamed whenever one of her feet began to roll. I still have the photos. She never put the roller blades on again. Eventually I got brave enough to buy both girls bikes. I got myself one too so I could demonstrate. We walked to the local schoolyard to try them out. I rode around and around in a big circle for a while, impressing Emily and Kate with my long-forgotten prowess. I was feeling pretty good about myself, still going around and around the track, until I remembered that I never learned how to make a 90-degree turn. Riding in circles was the height of my ability, a metaphor for my career as an outdoorsy mom. Kate grew to like her Strawberry Shortcake bike, but the training wheels never came off. Emily fared about as well on her new bike as she did on the roller blades. Teaching the girls to ride was not within the realm of possibility for me. Way too scary. The bikes are still in our shed, collecting cobwebs. Kate says she always felt deprived that I never bought her the only wheeled item that she really wanted. It was a motorized kiddie car, one of those overpriced pink monstrosities with a picture of Barbie on the side. It wasn’t fear that stopped me, but good taste. Emily is leaving for Bard in a month and nine days. She’s counting, I know. So am I, but in a different way. I’ve done my best to put the brakes on her childhood, to stop the wheels from turning and time from rolling on. Despite my best efforts, I’m proud to say I’ve failed. Emily is growing up despite my craziness. On August 11, I’ll be the instrument of her departure, driving the car that takes her 130 miles from home to a place where adventure, and, yes, peril, await. I’ll just have to hope for the best. She’s been mentioning lately that she’d like to learn to ride a bike since the buildings on campus are so far apart. But I know my kid. I make a mental note to buy her rainboots. She’ll be spending a lot of time slogging on foot through the mud. Next Post Low Pay is Fine, as Long as You Walk Like a Model…. I love that photo. Did you shoot it? It looks like film. It was film, and I did shoot it. I think it was in 1999 or 2000. Right after I left the comment, I noticed a faint time stamp on the bottom left-hand side of the image: July 24, 2000. Film photos definitely have a certain special something about them.